NCL invites applications from Indian nationals possessing minimum qualifications required for appointment to the following positions of Operator Trainees for operating highly automated and advanced Heavy Earth Moving Machines. An official notification is out from the NCL Recruitment department in which they said that they are going to filling up 619 posts of Operator Trainees posts. 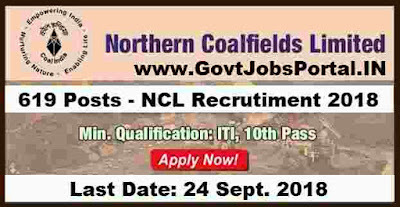 More information related to these government jobs under Northern Coalfield Recruitment process is given below in this article. Read the whole article carefully before applying these Government jobs in India. NOTE 1:- An applicant must have minimum 55% marks in Matriculation/ SSC/ High School or equivalent examination in order to be eligible for above mentioned posts. NOTE 2:- 1. The No. of vacancies shown above are tentative and may increase or decrease at the discretion of NCL management. 2. The horizontal reservation for Ex-Servicemen will be applicable across the vacancies of above shown posts and 10% vacancies are reserved (horizontally) for Ex-Servicemen. 3. None of the above positions fall into the Identified List of Positions for PWD candidates, by Government of India (as prescribed vide Notification No.16-15/2010-DD-III dated 29th July 2013), hence reservation for PWD is not applicable in this recruitment. 4. The crucial date for determining the eligibility/suitability of a candidate for different posts as required under the Notification shall be the Closing Date for submission of Application Online by candidates. What are the Eligibility Criteria for applying this NCL Recruitment? 10th pass from any recognized education Board of India and 12th pass & ITI in the following stream “Diesel Mechanic/Motor Mechanic /Fitter” & Valid HMV license issued from any RTA/RTO of Indian states can apply for these posts. All Indian can apply whose age is less than 30 years. 10th pass candidates and have higher Secondary education of Indian State can apply for these Posts. 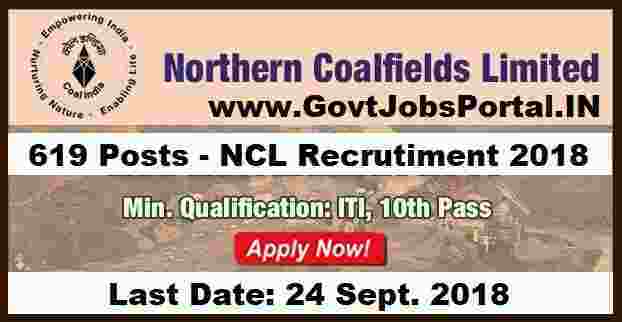 10th pass and must have a valid HMV license can apply for this NCL Recruitment process 2018. How much is the application Fee for applying this NCL Recruitment? Indian citizen who meet with the all eligibility criteria related to this NCL Recruitment process can apply online by paying ZERO application fee. These government job applications are invited from all Indian candidates for free. How We can apply for this NCL Recruitment? All application should be reach at destination address before 15th Oct. 2018. 10TH Sept. 2018 is the Opening Date to apply. 24th Sept. 2018 is the Last Date to apply online. 15th Oct. 2018 is the Last Date to accept the Hard copy of application. Disclaimer: We personally took this information from the following website:” http://nclcil.in “.